Teagan is a traditional-style medical ID bracelet with oval link chain and affixed medical ID tag. The durable links balance well with the simple tag, featuring a textured finish and a heart accent for a simple, feminine look. 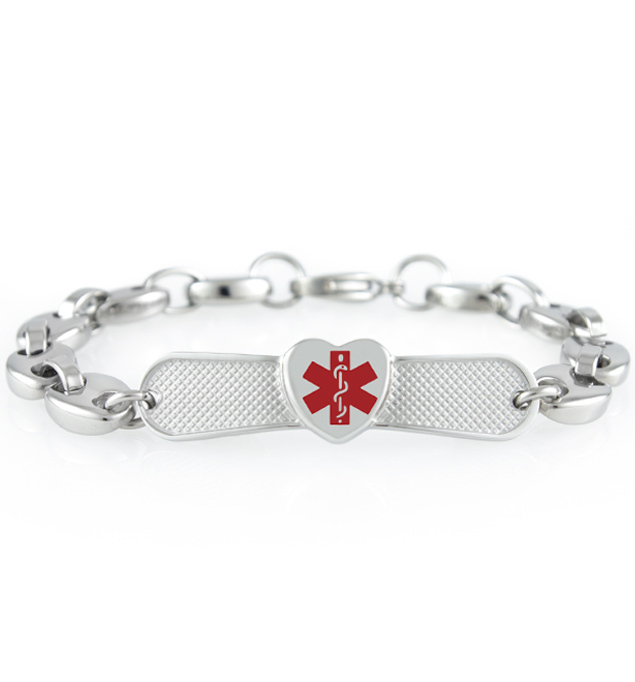 This hypoallergenic, pool-friendly medical bracelet has a classic red medical caduceus symbol on the front, designed to alert first responder to your medical information, which we can engrave on the back. Whether you or your loved ones wear a medical alert bracelet for food allergies (such as peanut, tree nut, soy, or wheat allergies), Type 1 Diabetes, epilepsy, autism, celiac disease, or any other chronic medical condition or treatment consideration, stainless steel medical bracelets are a terrific option. Water-safe and on-trend, these durable medical IDs are comfortable to wear alone or stacked with your favorite jewelry.